DailyDiapers - Advertising your products and services on DailyDiapers. Daily Diapers is a great place to advertise your AB/DL, age-play or other fetish products and services. We are one of the largest Adult Baby and Diaper Lover sites on the internet and offer more free to the end-user services than any other ABDL site. DailyDiapers has been online and growing for over sixteen years, so you know we're not going anywhere. As of August 2017 we are serving up an average of 3.4 MILLION hits per day, with an average of 285,000 UNIQUE visitors each month. This makes us the best place to reach the most active adult diaper wearers on the internet. A Note on Caching: We use a security/ DDOS Protection and Bandwidth Saving service to help DailyDiapers run smoothly, and reliably. Cached requests are actual page views, where a viewer is shown a saved copy of the page. Cached Requests as shown in our stats are real hits, and does not affect the presentation of ads. Advertising on www.DailyDiapers.com and other VTL DailyDi websites is inexpensive and has a proven track record. Our visitors are very loyal to our sponsors and routinely frequent sites which advertise here and which we recommend to them. Recently we have generated in excess of $1,200 in sales for a medical-supply site we have been recommending, and sent 119 new paid subscribers to an independent Adult Baby photo site. Below you will find our standard advertising packages, but we will happily work with you on any custom advertising options you may have in mind. e-Mail: [email protected] to arrange your ad campaign! E-Mail Blast - New and Always Available! Send a one-time announcement to our mailing list of over 2,400 ABDL kinksters. Can be all text, an image, or a combination of both. Great for new site or product announcements. Spam-free double opt-in mailing list managed by Constant Contact. Quick-Buy using the button below. Can purchase more than one if you want to send out a message every week or month for a specified period of time. Social Media Blast - New and Always Available! Your ad at the very top of the main page next to our logo. Best exposure! Your banner (up to 500 x 90 pixels) will be shown at the top of our main content page for all members to see. Product Spotlight - Available Now! Our product spotlight mixes graphics and text to highlight your product or service. This ad is seen by every visitor who enters our site! Located mid-way down our main content page, following the site updates. 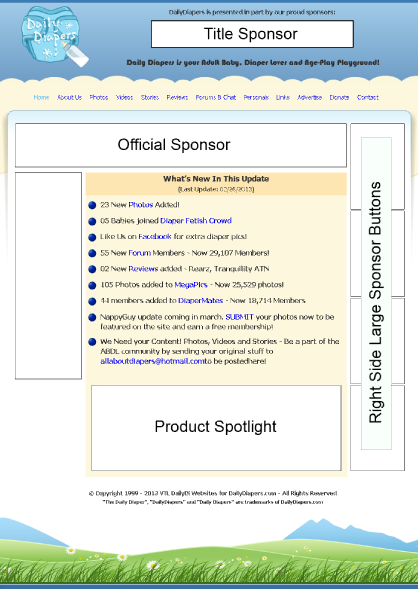 Right-Side Large Sponsor Buttons - Available Now! 120 x 240 sponsor button on our main content page. Banner Rotation - Available Now! Get thousands of impressions of your banner on all the pages of DailyDiapers, plus Diaper Mates, Diaper Gallery, Diaper Cuties and other partner sites. NOTE: Does not include the home page (see 'Title Sponsor' package). Options to fit every budget! We are currently serving each ad an average 130,000 impressions a week. Your banner (up to 580 x 60 pixels) will be shown at the top of all our main content pages for all members to see. NOTE: Does not include the home page (see 'Official Sponsor' package). Sponsor our double opt-in mailing list and have your three line ad appear at the bottom of our update notice. Currently sent to 1,600+ members every 2-3 days.